Each tablet or 5 ml suspension contains 200 mg. albendazole. 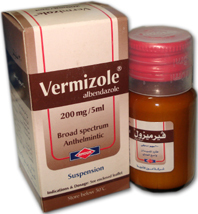 Albendazole (Vermizole®) is a benzimidazole derivative with a broad spectrum vermicidal, larvicidal and ovicidal activity. It inhibits protein synthesis and causes degenerative changes in the intestine and the enveloping membrane or capsule of the helminth (worm). 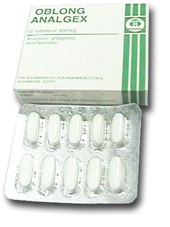 Albendazole is poorly absorbed from the intestine and rapidly metabolized in the liver to the active metabolite albendazole sulphoxide. Rarely, mild and transient cases of epigastric pain, diarrhea, nausea or headache may occur. Whipworm (Trichuris) 400 mg in a single dose. Pinworm ( Enterobius) 400 mg. in a single dose, may be repeated in 1-3 weeks. ( 15 mglkglday) for 8 days. For children under 2 years, a 200 mg dose is given. N.B. Shake the bottle before use. Tablets: Strips of 2 or 6 tablets ( 200 mg ) in packs of 1 strip. Suspension: Bottles of 30 ml ( 200 mgl5 rnl, ). Clovacaine® solution for toothache and dental caries.